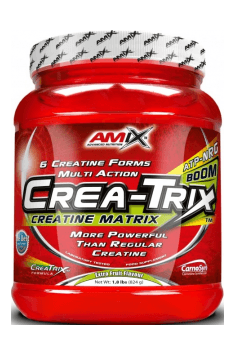 AMIX Crea-Trix™ is an advanced creatine complex enriched in beta-alanine. This combination guarantees impressive effects stemming both from the independent properties of both ingredients and their additional power from their synergistic effect. Creatine – constitutes one of the most popular supplements stimulating effort abilities and muscle anabolism. It is one of the best-researched substances with such a strong proven effect that it is often compared to illegal anabolic products. Contrary to them, however, creatine is completely safe even in long-lasting application. In order to ensure maximal effectiveness of creatine, its 5 forms were applied in the supplement, which are characterized by the highest bioavailability. They are: creatine monohydrate, creatine malate, dicreatine malate and tricreatine citrate. Such a complex combination will meet the expectations of even the most demanding sportsmen. Supplementation with creatine directly provides a substrate to the phosphagen energy pathway, which constitutes the main energy source in efforts of short duration, such as series during strength training or sprint sessions. Increased supply of this compound directly stimulates the effectiveness of this process, promoting abilities during training sessions. The enhancement of deriving energy from phosphagens is also related to decreased utilization of energy supplies. Importantly, not only muscle tissue derives benefits from creatine supplementation, but also other organs, such as brain, liver and bones. Increased strength constitutes a massive stimulus for the development of muscle mass, but it is not the only way creatine may support the growth of muscle tissue. It has the ability to store water in skeletal muscles increasing the volume of sarcoplasm. It is related to the improvement of muscle nourishment, both by stimulating its abilities during training and by facilitating regeneration and building muscle tissue. Moreover, research shows the ability of creatine to modulate the level of myostatin. They are the compounds, which limit building muscle tissue, regulated by the activity of the protein GASP-1. Creatine demonstrates the ability to inhibit the effect of myostatin (therefore it decreases the factor inhibiting muscle anabolism), without influencing the activity of GASP-1. It is another autonomous mechanism of stimulating muscle tissue growth by creatine. Supplementation with creatine also constitutes the form of prophylaxis od cardiovascular diseases. It influences the increase of creatine kinase efficiency, which is an enzyme responsible for the production of energy in the conditions of increased organism’s burden. Therefore, it’s pro-health effect on the tissues of the circulatory system will be especially effective among physically active people. Supplementation with creatine is also conducive to regeneration of damages in the area of the cardiovascular bed. Creatine is also an effective form of prophylaxis of the health of the nervous system. It regulates ATP levels in the nervous cells, prevents the accumulation of calcium ions inside them, which in excess have neurotoxic effect. Some studies also indicate the ability of creatine to modulate the communication between neurons, which is demonstrated as, among others, reduction of depression symptoms. Beta-alanine – the compound, commonly added to pre-workout supplements, the effect of which is sensible in the form of skin tingling. Its main mechanism of operation is based on increasing the level of carnosine, for which beta-alanine is a precursor. In the supplement its patent-protected formula was applied, characterized by the highest bioavailability, CarnoSyn®. Carnosine plays the function of an acid-base environment buffer in muscles. In relation to this, its increased concentration will delay the storage of lactic acid and decrease its effects. It causes not only the increase of effort abilities in long-lasting efforts by delaying fatigue, but also increased ability to regenerate. Leveling up pH in muscle tissue enables the application of larger stimuli during training with the simultaneous shortening of the time needed to fully restore effort abilities. Scientific studies and sportsmen’s experience show that the combination of creatine supplementation with beta-alanine drastically increases the effectiveness of both these supplements. Apart from a considerable improvement of effort abilities and endurance as well as increase of the pace of regeneration and muscle anabolism, this combination also has the ability to increase fat burning. Synergistic effect of beta-alanine and creatine turns out to be extremely effective and allows to get rid of excess weight faster. In the supplement there are also three mineral compounds, essential for the functioning of the organism, i.e. calcium, sodium and potassium in the form of phosphates. The additive of electrolytes allows to supplement losses created as a result of effort. Maintaining proper water-electrolyte balance is a guarantee of all metabolic processes in the organism and allows to maintain the highest physical efficiency. Summing up, AMIX Crea-Trix is an incredibly effective combination of creatine in five bioavailable forms with beta-alanine. Such an advanced composition of the product ensures maximization of the effects of both compounds, both when it comes to their independent and synergistic effects. An additive of electrolytes regulates water-electrolyte balance, allowing to maintain full efficiency of metabolic processes. This supplement constitutes great support for all people practicing strength training or short-lasting disciplines. AMIX Advanced Nutrition is a British brand of supplements for athletes. Its biggest asset is the highest quality of a production, which is based on the latest available technologies and research. That’s why AMIX products meet all the expectations and wishes of even the most demanding consumers. What also distinguishes this brand are very reasonably prices. Maltodextrins (glucose polymer), creatine monohydrate, acidity regulator - citric acid, ethylated creatine HCl, dicalcium phosphate, acidity regulator - calcium carbonate, trikreatin malate, creatine citrate, dikreatin malate, Kre-Alkalyn creatine, beta-alanine (CarnoSyn), Phosphate phosphate, disodium phosphate, aroma, color: multifruit flavor - beet root extract, sweetener (Sucenda sucralose, acesulfame K), anti-caking agent: silicon dioxide.